1. Place eggs in a medium saucepan, cover with cold water by 1 inch, and bring to a boil over high. Remove pan from heat, cover, and let sit for 11 minutes. transfer eggs to a large bowl of ice water and let cool for 5 minutes. 2. Meanwhile, combine yogurt, mayonnaise, mustard, curry powder, and salt in a medium bowl; season with pepper. Stir in the onion, celery, and chives. 4. 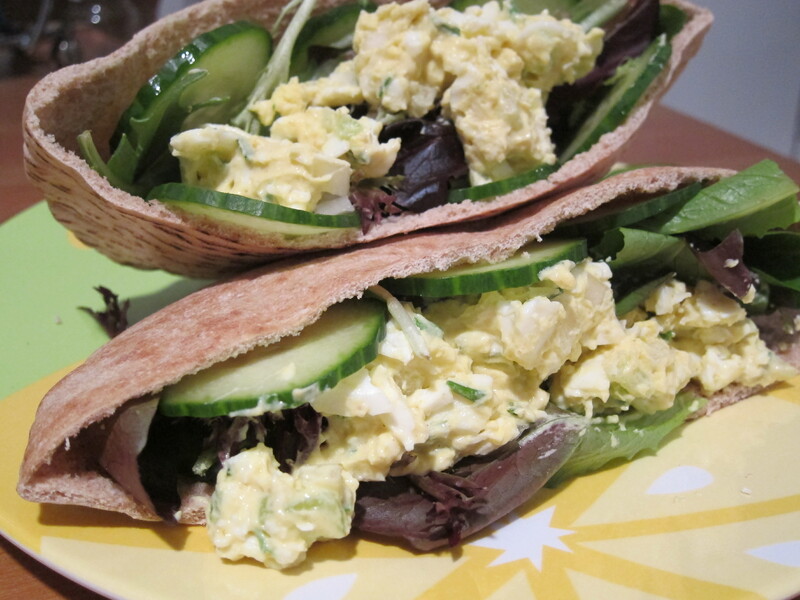 Stuff each pita with a quarter of the greens and the cucumber slices. Spoon a quarter of the egg salad into each and serve immediately.